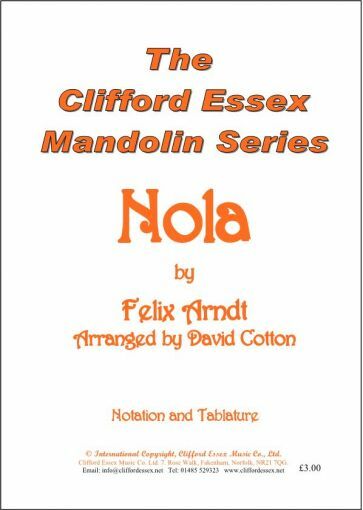 Location: /Sheet music/Mandolin Solos/NOLA BY FELIX ARNDT ARRANGED BY DAVID COTTON. 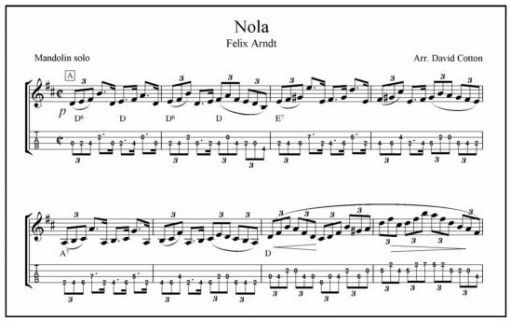 Just to behold you is a treat that's hard to beat"
'Nola' uses the entire range of the mandolin neck and the tablature is indicative of how you may choose to play it, but do feel free to adapt it to your own playing style. It's a jaunty piece with nice ragtime overtones. Don't be tempted to rush it - play it lightly and with good humour! THE HARRY LIME THEME BY ANTON KARAS. SOUNDS SUPERB ON THE BANJO.